90:00+6:06 The referee signals the end of the game. 90:00+3:57 The assist for the goal came from Dean Cox. 90:00+3:57 GOAL - Stephen Dawson:Leyton Orient 3 - 2 Bristol Rovers Stephen Dawson finds the net with a goal from inside the area high into the middle of the goal. Leyton Orient 3-2 Bristol Rovers. 90:00+3:37 A cross is delivered by Lee Brown, save made by David Button. 90:00+3:00 Eliot Richards fouled by Elliot Omozusi, the ref awards a free kick. Free kick taken by Lee Brown. 90:00+2:32 Michael Smith delivers the ball, David Button makes a save. 90:00+1:41 Foul by Marc Laird on Wayne Brown, free kick awarded. Lee Brown restarts play with the free kick. 90:00+0:16 Assist on the goal came from Scott McGleish. 90:00+0:16 GOAL - Eliot Richards:Leyton Orient 2 - 2 Bristol Rovers Eliot Richards grabs a goal from just inside the area to the bottom left corner of the goal. Leyton Orient 2-2 Bristol Rovers. 86:23 Michael Smith crosses the ball, save by David Button. 84:38 Terrell Forbes fouled by Eliot Richards, the ref awards a free kick. Direct free kick taken by David Button. 83:41 The ball is swung over by Charlie Daniels, save by Scott Bevan. 83:08 Corner from the left by-line taken by Craig Stanley, fantastic save by David Button. 81:26 Substitution Jonathan Tehoue joins the action as a substitute, replacing David Mooney. 81:03 Wayne Brown takes a shot from inside the box clearing the bar. 80:56 The ball is swung over by Michael Smith, Terrell Forbes makes a clearance. 79:38 David Mooney fouled by Craig Stanley, the ref awards a free kick. Jimmy Smith fires a strike on goal direct from the free kick, save by Scott Bevan. 78:45 The ball is sent over by Chris Zebroski, Ben Chorley makes a clearance. 75:15 Substitution Eliot Richards on for Mustapha Carayol. 74:28 Foul by Chris Zebroski on Marc Laird, free kick awarded. Ben Chorley restarts play with the free kick. 73:24 Effort on goal by Wayne Brown from long range goes harmlessly over the target. 72:54 Craig Stanley produces a cross, clearance made by Ben Chorley. 71:43 Jamie Cureton is flagged offside by the assistant referee. Byron Anthony restarts play with the free kick. 70:42 The ball is swung over by Jamie Cureton. 69:53 Free kick taken by Ben Chorley. 69:53 Substitution Stuart Campbell replaces Mathew Gill. 69:53 Marc Laird fouled by Craig Stanley, the ref awards a free kick. 68:38 Assist on the goal came from Wayne Brown. 68:38 GOAL - Chris Zebroski:Leyton Orient 2 - 1 Bristol Rovers Chris Zebroski gets on the score sheet with a goal from inside the box to the top left corner of the goal. Leyton Orient 2-1 Bristol Rovers. 67:31 Charlie Daniels delivers the ball from the free kick left-footed from right channel, clearance by Lee Brown. 67:31 Booking Mathew Gill booked for unsporting behaviour. 67:27 Free kick awarded for an unfair challenge on Stephen Dawson by Mathew Gill. 66:17 Dean Cox sends in a cross. 64:19 Direct free kick taken by Ben Chorley. 64:19 Substitution Elliot Omozusi is brought on as a substitute for Leon McSweeney. 64:19 Foul by Craig Stanley on David Mooney, free kick awarded. 63:37 Craig Stanley takes the direct free kick. 63:37 Booking Terrell Forbes receives a yellow card for unsporting behaviour. 63:19 Foul by Terrell Forbes on Scott McGleish, free kick awarded. 62:00 Mustapha Carayol sends in a cross, clearance by Marc Laird. 61:15 Craig Stanley restarts play with the free kick. 61:15 Booking The referee shows Leon McSweeney a yellow card for unsporting behaviour. 61:06 Leon McSweeney gives away a free kick for an unfair challenge on Chris Zebroski. 59:06 The ball is swung over by Chris Zebroski, Jimmy Smith makes a clearance. 58:11 Lee Brown delivers the ball, Ben Chorley makes a clearance. 56:40 David Mooney produces a right-footed shot from just outside the box that goes wide right of the target. 56:09 Wayne Brown takes a shot. Ben Chorley gets a block in. 55:42 Mustapha Carayol decides to take the corner short. 55:33 A cross is delivered by Mustapha Carayol, Stephen Dawson manages to make a clearance. 55:09 Mustapha Carayol produces a cross, save by David Button. 54:53 Lee Brown takes a shot. Save by David Button. 53:34 Free kick awarded for a foul by Michael Smith on Stephen Dawson. Charlie Daniels has a direct shot on goal from the free kick, save by Scott Bevan. 53:09 Dean Cox takes a outswinging corner from the right by-line played to the near post, Mathew Gill manages to make a clearance. 50:32 Leon McSweeney crosses the ball, clearance by Dan Woodards. Jimmy Smith takes a shot. Save made by Scott Bevan. 48:49 The ball is delivered by Mustapha Carayol. 46:31 Shot from deep inside the area by David Mooney clears the crossbar. 45:39 Free kick awarded for a foul by Chris Zebroski on Stephen Dawson. David Button restarts play with the free kick. 45:00+4:50 The match has reached half-time. 45:00+3:30 Lee Brown produces a cross, Ben Chorley makes a clearance. 45:00+3:07 Free kick awarded for a foul by Ben Chorley on Chris Zebroski. Mathew Gill restarts play with the free kick. 45:00+2:28 Long distance shot from Ben Chorley misses to the left of the net. 45:00+2:11 Michael Smith gives away a free kick for an unfair challenge on Charlie Daniels. Dean Cox takes the free kick. 44:23 Short corner taken by David Mooney. 44:12 Dean Cox takes a shot. Save by Scott Bevan. 43:01 Charlie Daniels takes a short corner. A cross is delivered by Dean Cox, Jimmy Smith produces a headed effort from deep inside the six-yard box which goes wide of the right-hand upright. 41:41 Shot from just outside the box by Dean Cox misses to the right of the goal. 40:48 Corner taken by Mathew Gill from the right by-line to the near post, Jimmy Smith makes a clearance. 40:41 Chris Zebroski crosses the ball, Jimmy Smith gets a block in. 38:50 David Mooney fouled by Byron Anthony, the ref awards a free kick. Free kick crossed by Dean Cox, Scott McGleish manages to make a clearance. 38:13 Substitution Marc Laird on for Scott Cuthbert. 36:47 Inswinging corner taken right-footed by Mathew Gill, Shot from just outside the box by Craig Stanley misses to the right of the target. 36:34 Craig Stanley takes a shot. Save made by David Button. Correction - 34:41 Outswinging corner taken by Mathew Gill from the right by-line. Chris Zebroski has a overhead kick shot. David Button makes a comfortable save. 34:41 Corner taken by Mathew Gill. 34:36 Substitution (Bristol Rovers) makes a substitution, with Dan Woodards coming on for Adam Virgo. 32:17 The ball is swung over by Michael Smith, Jimmy Smith manages to make a clearance. 30:19 Free kick awarded for an unfair challenge on Mustapha Carayol by Scott Cuthbert. Lee Brown restarts play with the free kick. 29:48 Jamie Cureton has shot on goal from just outside the area which goes wide of the right-hand upright. 28:01 David Mooney challenges Adam Virgo unfairly and gives away a free kick. Free kick taken by Adam Virgo. 26:22 Unfair challenge on Leon McSweeney by Chris Zebroski results in a free kick. Leon McSweeney takes the free kick. 25:48 Corner taken short by Charlie Daniels. 24:17 The ball is crossed by Charlie Daniels, Shot from close range by David Mooney misses to the left of the goal. 24:00 Mustapha Carayol produces a cross, Charlie Daniels manages to make a clearance. 22:40 Assist by David Mooney. 22:40 GOAL - Ben Chorley:Leyton Orient 2 - 0 Bristol Rovers Placed penalty scored by Ben Chorley. 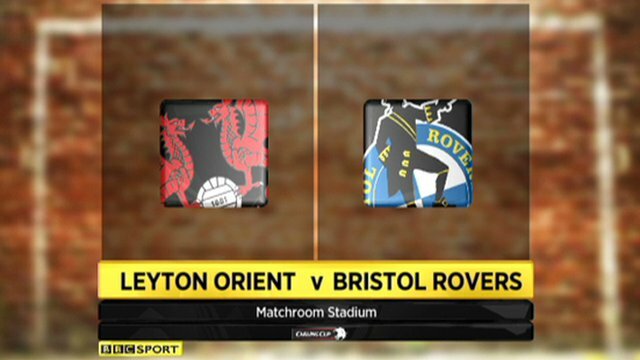 Leyton Orient 2-0 Bristol Rovers. 21:49 Unfair challenge on David Mooney by Wayne Brown results in a Penalty. 21:07 Corner taken right-footed by Mathew Gill from the left by-line, save by David Button. 20:55 Chris Zebroski takes a shot. Ben Chorley gets a block in. 20:32 Scott McGleish challenges Jimmy Smith unfairly and gives away a free kick. Direct free kick taken by Jimmy Smith. 18:53 David Mooney challenges Byron Anthony unfairly and gives away a free kick. Free kick taken by Michael Smith. 17:38 Dean Cox provided the assist for the goal. 17:38 GOAL - David Mooney:Leyton Orient 1 - 0 Bristol Rovers David Mooney grabs a goal from inside the penalty box low into the middle of the goal. Leyton Orient 1-0 Bristol Rovers. 14:45 Effort on goal by Chris Zebroski from inside the penalty box misses to the right of the target. 13:41 A cross is delivered by Charlie Daniels, Scott Bevan makes a comfortable save. 10:38 Dean Cox challenges Craig Stanley unfairly and gives away a free kick. Adam Virgo restarts play with the free kick. 10:02 Effort on goal by Mustapha Carayol from 35 yards missed to the left of the target. 8:36 The ball is swung over by Dean Cox, Adam Virgo manages to make a clearance. 7:34 Centre by Craig Stanley, Mustapha Carayol takes a shot. David Button makes a comfortable save. 4:57 Free kick awarded for an unfair challenge on Stephen Dawson by Craig Stanley. Direct free kick taken by Ben Chorley. 4:17 Effort from deep inside the area by Mustapha Carayol misses to the right of the target. 3:49 Outswinging corner taken right-footed by Mathew Gill from the right by-line to the near post, Ben Chorley makes a clearance. 3:20 Corner taken by Mathew Gill from the left by-line, Charlie Daniels makes a clearance. 3:07 Chris Zebroski takes a shot. Blocked by Ben Chorley. 2:49 A cross is delivered by Wayne Brown, Ben Chorley makes a clearance. 0:29 Mustapha Carayol produces a right-footed shot from long distance which goes wide right of the goal.